Once you've picked the perfect location for your TV dashboard, it's time to securely mount it on the wall. In this article, we'll explain the different types of mounting brackets and how to find the right one for your TV. We'll also guide you through the steps for fixing your screen to the wall. Mounting a TV requires heavy lifting, so you may want to get a colleague to help you. A mounting bracket is the structure that holds your TV on the wall. For most TVs, there are several bracket options – so you'll need to find the right one for your TV weight and wall type. What are the different types of wall bracket? There are three basic types of bracket to choose from: fixed, tilt, and full motion. Which one you choose depends on where you plan to mount your TV and how much you think you'll need to adjust it for optimum visibility. The most basic mounts fix your TV flush to wall. Once it's mounted you won't be able to move the TV at all. These mounts let you angle the screen a few degrees up or down. This is useful if the TV is going to be high on the wall and you want to angle the screen down towards the viewer. These mounts usually have a moveable arm that allows the TV to extend out from the wall and be angled towards the viewer. To make it easier, we recommend using the VESA (Video Electronics Standards Association) standards. These are guidelines that match flat-screen TVs to appropriate wall mounts by measuring the distance between the four mounting holes on the back of a TV (distance horizontally x distance vertically). Common VESA sizes are 200 x 200, 400 x 400 and 600 x 400 depending on the screen size of your TV. The fastest and easiest way to find out the VESA size of your TV is by measuring it. Locate the four holes in the back of your television. Measure these from left to right and top to bottom. By now you should know the horizontal and vertical distance, between the holes and therefore the VESA size of your TV. Some TV manufacturers don’t follow VESA standards. 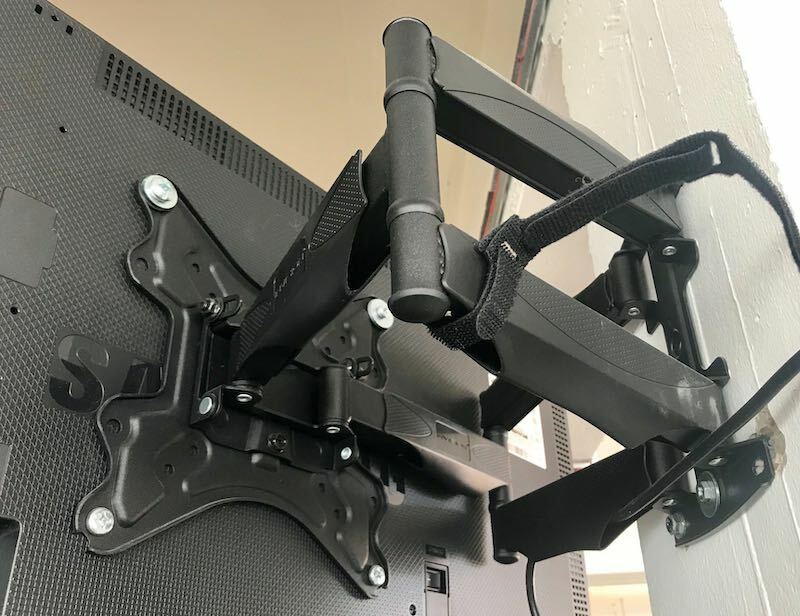 If your TV is one of these, you’ll need a universal mounting bracket – which can be adjusted to properly align with holes which don’t conform to standard VESA dimensions. Remember the bigger your TV screen, the heavier it'll be – and the more support it will need. Always compare your TV’s weight to the weight rating of your TV mount for safety. Your mounting bracket comes with 2 pieces: 1 that mounts to the TV and another that mounts to the wall. Start by attaching the TV part. It’s best to hold the TV upright rather than laying it face down while you do this. Make sure the screw holes are lined up properly, and the screws don’t prevent the mount from tilting or swivelling. Make sure your walls can hold the weight. Even though the TV bracket and screws will be designed to hold your TVs weight, your wall may not be able to. Lay the part of the bracket that mounts on your wall against the part you’ve just fitted to your TV. Use a tape measure to work out the space between the bottom of the TV and the bottom of the bracket. Then measure the length of your TV. Draw this in pencil on the wall where you want to put your set and mark the spot where the bottom of the bracket will sit. Line up the wall part of the bracket along this line on the wall – using a spirit level to keep it straight – and mark the drill holes with a pencil. Drill your holes in the wall and place your rawlplugs inside the holes, or lightly tapped with a hammer if needed. Position the bracket over the holes and attach it with screws. Connect everything you want to attach to your TV – like the power and HDMI cables – before you mount it. Then, with the help of someone else, lift the TV into place – attaching the 2 parts of the bracket with a screwdriver.